Pumpkin pancakes bring back lots of great memories for me. Memories of my first apartment in college with my best friend. Memories of the early stages of when my husband and I first stated dating, of our first fall together. A fall filled with pumpkin spice warmth and love and yumminess. Back then I lived close to campus. Close enough to walk so that I didn’t have to buy a parking sticker, but far enough that when it was cold out, it was not a fun walk to class in the morning. But guess who had a parking sticker? Mr. Table. He would drive over to my apartment at 7 in the morning to drive me to class, pumpkin spice lattes in hand. Sometimes he would bring us bagels, and sometimes I would cook us breakfast to eat before class. And one of his favorite things that I would make him were these healthy pumpkin pancakes. The warmth of the spices and yummy pancakes were so perfect for the cold days, and still remind me of our young puppy love. Our time together eating breakfast and my sweetheart driving me to class is still one of my favorite memories. 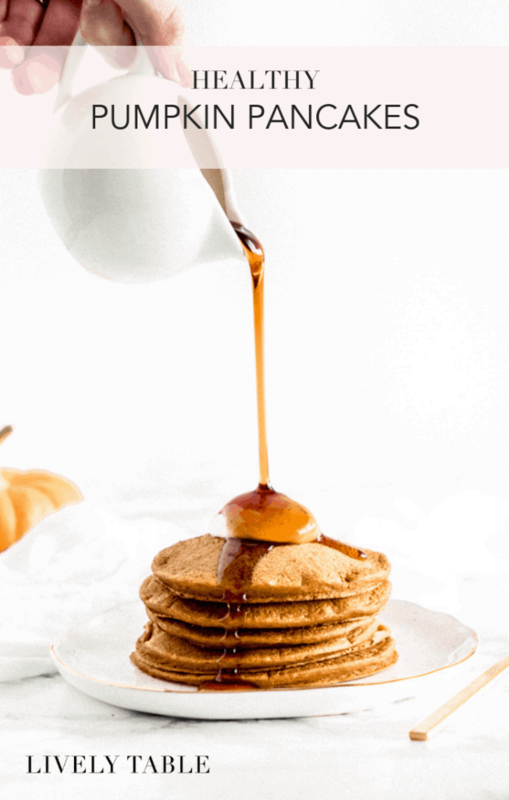 Over the years I have perfected these healthy pumpkin pancakes. They are so yummy and comforting, and perfect for a lazy Saturday breakfast in the fall. Serve them with some warm maple syrup, toasted pecans, pumpkin spice granola, or a dollop of greek yogurt, if you wish. 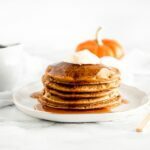 I hope you enjoy these healthy pumpkin pancakes as much as I do! Heat pancake griddle or skillet to 350°F or medium heat. In a large bowl, mix dry ingredients. In a separate bowl, mix all of the wet ingredients, except for the club soda or milk. Add to the dry ingredients and stir. Add club soda or milk until you reach the desired consistency. Let stand for a couple of minutes. The batter will thicken as it stands. Spray a preheated skillet pan or griddle with cooking spray or lightly grease with coconut oil. Pour about 1/4 cup of batter (more or less, depending on the size you want) onto the pan to form a circle. You may need to spread it a little with the bottom of you measuring cup. Let cook until you see bubbles forming in the batter’s surface. When the bottom is golden, flip and cook the other side until it is cooked through, about a minute. Repeat with remaining batter. Serve warm with honey or maple syrup. These pancakes are not sweet. If you want them sweeter, add 1 tbsp honey or 2 tbsp brown sugar to the batter! *For gluten-free, use a 1:1 GF flour blend. I like Bob’s Red Mill. I made these this morning they did not turn out at all. Followed the recipe to the letter and they would not cook no matter how long I tried. Too much moisture, not enough baking powered. Did anyone else have this problem? I’m sorry they didn’t turn out for you, Lee. I just checked the recipe and realized a left out the baking soda! That’s probably why they didn’t turn out! I’ll update it to reflect the baking soda. Also, if you use milk instead of club soda, you may have to increase the baking powder since club soda adds much more levity. Thanks for pointing that out! I can’t find the amount of oats to blend. Hi Krishna! You blend 1 cup of oats. Delicious! I beat my egg whites and folded them in to add some extra fluffiness. Appreciate a recipe with oatmeal and no egg yolks as I am trying to keep my cholesterol down. Hi Ally, I’m so glad you enjoyed the recipe. Thanks for stopping by! For GF will be 1 cup of oat and o1 cup of GF flour? You use oats and GF flour! How many calories and protein is in this recipe? Hi Taylor! I don’t provide nutrition info for my recipes, but you can calculate it using one of the many free online calculators!